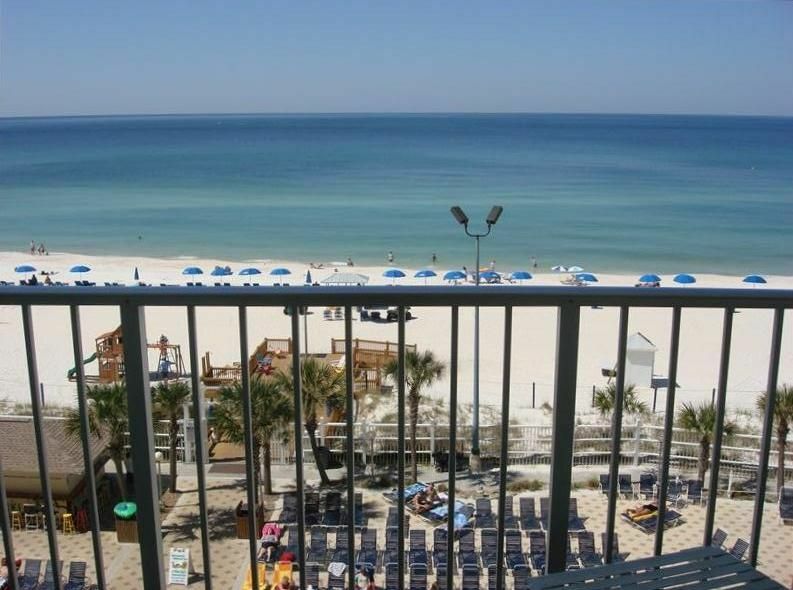 Our unit is located on the beach at the 'SUMMIT' on Thomas Drive with a beautiful view of the Gulf of Mexico and fantastic sunsets. This unit is only steps away from great restaurants and famous beach clubs 'Spinnaker's' and 'Le Vela's'! Steps to nearby sports rentals too! The unit has one bedroom, 1.5 baths. There is a separate bedroom with king size bed, TV, radio/clock and phone, a queen size sofa/sleeper in the living room and bunk beds in alcove in hallway. The fully equipped kitchen includes dishwasher, microwave, blender, coffee maker, cookware, utensils, dishes, toaster, and much more. Each unit has a 25 in. TV, VCR, and CD player. The complex has 2 swimming pools, (1 heated), 2 baby pools, hot tubs inside and outside, game room, oyster bar, tiki bar, his and her exercise rooms with saunas, snack bar, tennis courts, charcoal grills, lounge chairs by the pool, kiddie playground on the beach, ATM, and 24 hr. security. This was the best vacation I have ever had at the beach! The place was very nice, conveniently located, and the view was absolutely amazing! Mr. Terry was very nice, easy to get in touch with, and I would recommend this place to anyone looking to have a relaxing, wonderful stay in PCB. I am so glad you had a GREAT vacation! Thanks for the kind words... come back soon! Had a wonderful and relaxing time on our vacation stay. Terry, the owner, is absolutely amazing to work with!! We will most definitely be coming back to stay in this condo. This was our second year at Terry' s condo it was perfect just like last time! He had many new updates in the condo (washer & dryer...mother of 3 this made me very happy). Price was great for right on the beach! Terry is amazing he responded quickly to all my texts and I also added my mom last minute and he was very understanding and ok with the last minute changes. Loved the 6th floor views, I love this place in general and get sad everytime we have to leave. Thank you so much for renting to us again!!! Our family had a great time staying at this condo rented by Terry. We found Terry very great to work with. He responded to all questions and concerns very quickly. A beautiful view from the 14th floor from this condo. We had some issues with the cleanliness of the condo upon arrival, but Terry acted swiftly to terminate the very new cleaning lady. The beach was very clean, the pool tons of fun for the kids, and the prices at the local Bikini Bobs Bar and Grill were very reasonable. We saw neat looking jelly fish. Slingshot ride located across the street from the condominiums was entertaining to watch from the balcony, but could be slightly noisy. I appreciated using the dryer at the condo for wet beach towels. All in all, we would strongly consider renting this condo again from Terry. The price was very reasonable and the location was superb. Thanks, Terry, for the opportunity to make some great family memories at 1409 Summit Condominium. My family of 5 had a great stay here! Lots of updates and very clean! Terry was great to work with, too. We would definitely stay here again! I am glad you and your family enjoyed our condo! Come back soon!